Alaska-bound travelers taking BC Ferries Inside Passage service from Port Hardy to Prince Rupert must drive to the northeast coast of Vancouver Island. Prince Rupert, at the west end of the Yellowhead Highway, is the departure point for Alaska State Ferries sailing the Inside Passage north. 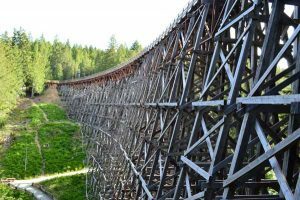 This itinerary may also be driven in reverse for return travelers, and makes an especially logical choice for motorists coming down the Cassiar Highway. Allow plenty of time for the drive. A world-renowned travel destination, Vancouver Island offers travelers many distractions, enough to keep them on the island for several days, so plan accordingly. Ferries from the mainland to south Vancouver Island (see map) land at Victoria via the BlackBall ferry from Port Angeles, WA; the Washington State Ferry to Sidney from Anacortes, WA; or BC Ferries via Swartz Bay (from Tsawwassen), Nanaimo/Duke Point (from Tsawwassen) and Nanaimo/Departure Bay (from Horseshoe Bay). Trans-Canada Highway 1 connects Victoria and Nanaimo, and Highway 19 connects Nanaimo with Port Hardy. Miles from Victoria (V) shown. V 0 VICTORIA (pop. 82,653) British Columbia’s Capital city and a major tourist destination. Visitor Information: or stop by the visitor centre at 812 Wharf St., overlooking the Inner Harbor; phone 250-953-2033. Attractions include the Legislative Buildings and the Royal British Columbia Museum. 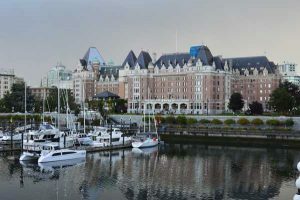 Have tea at the Fairmont Empress (pictured at right), a very popular event so book in advance. Walk around Victoria’s scenic Inner Harbor. V 4.8 Exit 8 for Helmcken Road, View Royal; hospital. NOTE: Trans-Canada 1 between Victoria and Nanaimo has 2- and 4-lane divided and undivided highway as well as 3-lane road with intermittent north- and southbound passing lanes. Sections of highway divided by concrete barriers restrict left-hand turns. Watch for U-turn routes: these are narrow with short turning radius and may be difficult if not impossible for large RVs and trailers to negotiate. Posted speed limits from 50 to 100 kmph/31 to 62 mph, with speed zones and curves as posted. Narrow road shoulders. CAUTION: Watch for bicyclists along the highway, day and night! Freeway portions of highway have both exit ramps and traffic lights controlling 3-way and 4-way stops at junctions. V 9 Exit 15 to McCallum; Shell gas/diesel station to east, Subway. V 23.6 Exit for Bamberton, Mill Bay Road, Brentwood Ferry. Bamberton Provincial Park has camping, sandy beach, fishing. V 26.9 Access to historic Kinsol Trestle, now part of the Cowichan Valley Trail. V 38.2 DUNCAN (pop. 4,986) Traffic light at Trunk Road/Government Street; Coop, Petro-Canada, Shell and Mohawk gas stations; convenience stores, fast food, Save-On. Access west to downtown Duncan. Visitor information: Cowichan Regional Visitor Centre, 2896 Drinkwater Rd., 250-746-4636; 1-888-303-3337. Gateway to the Cowichan Valley region, Duncan has all visitor services, a post office, medical clinics, RCMP, police and churches. Shopping and services are found along Trans-Canada 1. Cowichan Valley Museum is located in the Duncan Train Station at 130 Canada Ave. and there are fascinating totems adjacent the museum; phone 250-746-6612. The Duncan Farmers’ Market in City Square, Saturdays from 9 A.M. to 2 P.M.
V 48.2 Exit east for CHEMAINUS (pop. 3,900) Traffic light at Henry Road; Co-op gas with convenience store at northwest corner. Famous for its 44 outdoor murals and for the Boeing 737 which was sunk off the coast there as an artificial reef for scuba divers. All services available. V 55.7 Traffic light at Roberts Street. Drive west on Roberts Street to First Avenue and downtown LADYSMITH (pop. 8,328); all services. V 66.2 Highway splits northbound: Keep to left for Highway 19 North to Parksville, Campbell River and Port Hardy; keep to right for Trans-Canada Highway 1/Highway 19A (log follows) for NANAIMO city centre (pop. 87,000) and BC Ferries Departure Bay terminal for ferry service to Horseshoe Bay. Port Hardy-bound travelers exit from Trans-Canada Highway 1 to continue north on Highway 19/Nanaimo Parkway. Kilometreposts northbound show distance from Duke Point. Visitor Information: Open daily, year-round, Exit 21. Downtown visitor kiosk with maps, brochures, guides and event information (May–September). Nanaimo is a transportation hub, connecting passengers and vehicles to/from the mainland via BC Ferries Tsawwassen–Duke Point service, and Horseshoe Bay–Departure Bay service, via float plane terminals and airport. V 88.3 Exit 46 to PARKSVILLE and junction with Highway 19A North/Oceanside Route, a 2-lane highway that gives access to a string of resorts, beaches and tourist facilities between Parksville and Qualicum Beach. Attractions: Rathtrevor Provincial Park Campground and Beach; Deep Bay Marine Field Station, Milner Gardens and Woodland. Visit Second Avenue in Qualicum Beach. V 91.2 Exit 51, Highway 4A north leads to Englishman River Falls Provincial Park with campground. V 96.7 Exit 60 to Highway 4 to Port Alberni, Tofino and Pacific Rim National Parks. This area is chock-full of attractions that include camping, parks, lakes and is the route to the west coast beaches of Vancouver Island. V 149.4 Traffic light at Exit 144 Hamm Road; Saratoga Beach, Oyster Bay and Miracle Beach Provincial Park (8 km/5 miles), one of Vancouver Island’s most popular parks. Camping and day-use. V 165.8 Junction of Highway 19 with Highway 19A and Highway 28 (Gold River Highway). Access is to Parkside Campground & RV Park, 5 km/3 miles west. CAMPBELL RIVER (pop. 36,096) is located on the east coast of North/Central Vancouver Island, 3.5-hour drive from Victoria and less than 2 hours north of Nanaimo. Visitor Information: Located in the same building as the Art Gallery, at 1235 Shoppers Row; phone 1-877-286-5707. Harbourfront attractions: Discovery Fishing Pier, Discovery Passages Aquarium and Maritime Heritage Centre. Pier Street Farmers Market is here Sundays 10 a.m.-2:30 p.m. May–Sept. V 174.9 Morton Lake Provincial Park (10 miles west to campground). V 282.1 Paved road east (posted 80 kmph) leads 15 km to TELEGRAPH COVE (pop. 20). This historic boardwalk village is a very picturesque community on Vancouver Island and a popular tourist destination in summer; all services. V 286.6 Turnoff for Port McNeill via Campbell Way. PORT MCNEILL (pop. 2,600); Visitor Information: Port McNeill Information Centre is in the same building with the Chamber of Commerce and Harbor Manager’s office at 1594 Beach Dr. (on the waterfront); phone 250-956-3881. Stop in to make reservations for whale watching, kayak rentals or fishing charters. 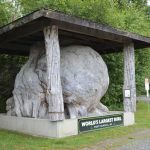 Port McNeil is home to the world’s largest burl (pictured here). V 309.2 Welcome to Port Hardy turnout at junction with Bear Cove Highway, which leads east 3 miles/5 km to BC Ferries terminal at Bear Cove. V 309.9 Turnoff for Quatse River Regional Park and Campground on Byng Road. V 312.3 Highway 19 ends/begins at junction with Market Street in PORT HARDY (pop. 4,500). Visitor Information: Port Hardy & District Chamber of Commerce/Visitor Information Centre, 7250 Market (at the bottom of Main Street); phone 250-949-7622. Port Hardy has all visitors services including hotels, motels, cabins, several bed and breakfasts and campgrounds; restaurants and fast-food outlets; gas stations; marine supplies; and retail services. 24-hour ATMs inside lobbies of bank and credit union. WiFi at Cafe Guido’s coffee shop and elsewhere (ask at Visitor Centre).